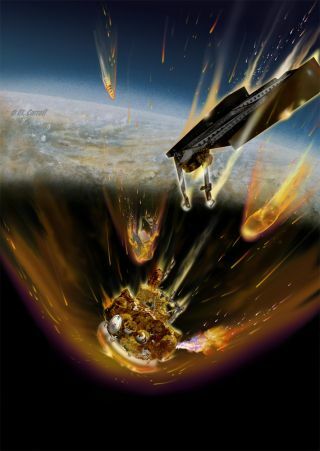 A failed Russian Mars probe is expected to come crashing back to Earth next weekend, according to news reports. The Phobos-Grunt spacecraft was stranded in Earth orbit shortly after its Nov. 8 launch, and it's been circling lower and lower ever since. Russian space officials now estimate that the probe will meet its fiery demise in Earth's atmosphere next Sunday (Jan. 15). "As of Wednesday morning, the fragments of Phobos-Grunt are expected to fall January 15, 2012," Alexei Zolotukhin, spokesman for Russia's military space forces, told Russian news agencies Wednesday (Jan. 4), according to Agence-France Presse. "The final date could change due to external factors." Phobos-Grunt is a huge spacecraft, tipping the scales at 14.5 tons. Much of that weight is toxic hydrazine fuel, prompting some observers to worry about potential environmental impacts of the probe's looming re-entry. Most of Phobos-Grunt should meet that same fate. Experts predict that just 20 to 30 pieces, weighing a maximum of 440 pounds (200 kilograms), will actually hit the ground (or water). Just where those pieces will come down is impossible to say at the moment, since analysts don't know the precise timing of Phobos-Grunt's re-entry. As of now, much of the globe is potentially in the line of fire. "We know it'll come down somewhere between 51 [degrees] north and 51 south latitude," Brian Weeden, a technical adviser at the Secure World Foundation, told SPACE.com. Phobos-Grunt's demise comes closely on the heels of two other uncontrolled satellite falls recently. NASA's 6.5-ton UARS climate satellite re-entered over the Pacific Ocean in September, and Germany's 2.7-ton ROSAT satellite crashed over the Indian Ocean a month later. Nobody on the ground was hurt in either instance. The $165 million Phobos-Grunt mission's chief goal was to grab soil samples from the surface of the Martian moon Phobos and send them back to Earth ("grunt" means "soil" in Russian). But the spacecraft's main engines didn't fire as planned to send Phobos-Grunt toward the Red Planet, and the probe got stranded in Earth orbit. Despite repeated attempts, engineers have been unable to communicate with the spacecraft, and most experts think Phobos-Grunt is dead in the water. Phobos-Grunt's failure was just one of a series of embarrassing setbacks for the Russian space program in 2011. On Feb. 1, for example, a Rockot launch vehicle failed to place an Earth-observing satellite in the proper orbit. A Proton rocket similarly underperformed on Aug. 18, delivering a $300 million communications satellite to the wrong orbit. On Aug. 24, the unmanned Progress 44 supply ship crashed while hauling cargo to the International Space Station, done in by a problem with its Soyuz rocket. Russia uses a similar version of the Soyuz to launch astronauts to the space station, so manned flights were put on hold until the problem with the rocket could be identified and fixed.